Some days I'm the owner, other days it's a toss-up! Okay, first you have to figure out that you're the alpha dog. Once you've learned that, try and explain it to a daschund. Especially one that is an afghan and pillow hog. 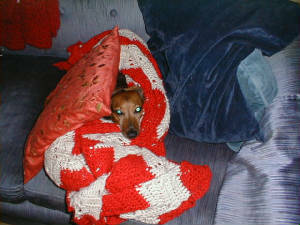 By the way... NEVER sit on a pillow or afghan without checking for daschunds. It makes them grumpy if you sit on them. What's going on in my small world? January 2007 - Decided to create a place to put pictures of past and present family. This includes people and critters. It's also a small tribute to my Dad and Mom who have gone over the Rainbow Bridge to meet up with pets and family members. Please be sure to get in touch with any comments or reactions you have to my site. The Past & The Present is what keeps us going.